Super Dragon Ball Heroes: World Mission is making a “Switch”!! Well, now we’re getting back to some good old-fashioned fighting. The first part of Volume 6 was spent dealing with everyone’s personal issues following to big reveal in the second episode. With renewed determination, Team RWBY, Team JNPR, Maria Calavera and Qrow Branwen decide to follow through with Jaune’s plan and make their way to Atlas. However, they encounter resistance along the way. Ruby and the others have to deal with Caroline, while deep in the woods, Blake is reunited with Adam Taurus. Adam’s fixation on Blake has driven him to brink. He can’t seem to let the poor girl go and doesn’t want to. He has found kinship within Blake who once harbored the same prejudice towards humans as he did until she defected after seeing the brutality of Adam’s methods. Adam hasn’t been in the best mental state after losing control on the White Fang and losing Blake. He wants to bring her back at any cost, however, Adam appears to have taken on more than just doing that. During their fight, Adam has attempted to deliver several killing blows to Blake who avoids them using her Shadow copies. The real confirmation came when Adam stabbed his sword through another of Blake’s Shadow copies without hesitation and without knowing that it was another copy. This could illustrate that Adam feels that no one deserves Blake except for him, and he will kill her just to keep her from anyone else. Thankfully, Blake didn’t have to fight Adam alone. Yang comes to her aid and turns the tide of the battle. After what Adam did to her at the Fall of Beacon Academy, you would think that Yang would lose her s*** and go off on Adam like a rabid dog. Shockingly, during their heated fight, Yang was surprisingly calm. Her father Taiyang’s training to help not rely on her Semblance is paying off. 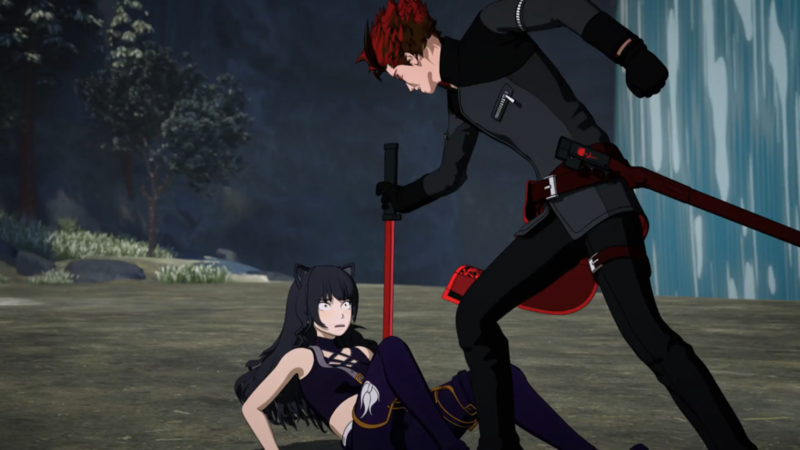 And for those of you RWBY fans looking for Blake/Yang relationship (dubbed by fans as “Bumblebee), there is a hint of potential – key words “hint-of-po-ten-tial.” Fans have been speculating a possible budding relationship between them that goes beyond friends. Like I said, potential is there but in small doses. One could look to Jaune’s sister Saphron Cotta-Arc and her partnership with Terra Cotta-Arc as an example. 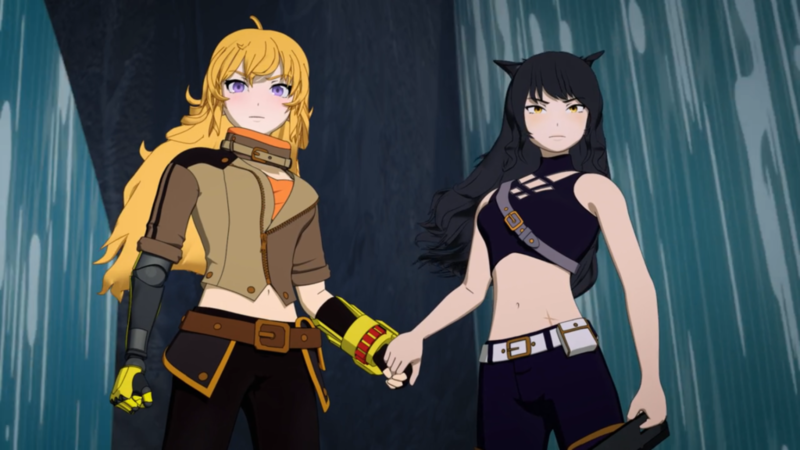 Another possible clue is when Yang is able to push Adam back and then proclaim with Blake that “they are protecting each other.” They even make this proclamation as they hold hands. But, let’s not look too deep into this just yet. The clues are there along with the possibility. Let’s just take a step back from this and see what unfolds. 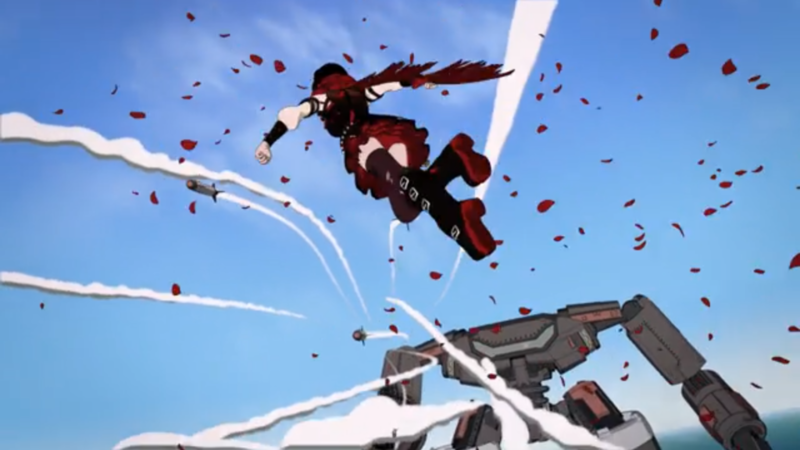 While I love character development, it is nice to get back into what made us fall in love with RWBY in the first place – the fight scenes. Once again, smooth, fluid animation and the ability to see everything that’s happening with no blurring is an absolute delight. And another thing I noticed is that the battles are contained. They’re kept small. By keeping the battles small, that makes them more intense because you can see the action without having to adjust the camera. And it works. Even when Ruby and everyone else was fighting against Caroline Cordovin in her giant robot, the battle was large scale, but it still felt contained and controlled and it works. Nothing big needed to happen with that. And that’s good. This was a good episode. We’re getting back to the action and now the story can move along to Atlas and the gang can finally get to that third relic. Anybody else smell a Weiss family reunion?